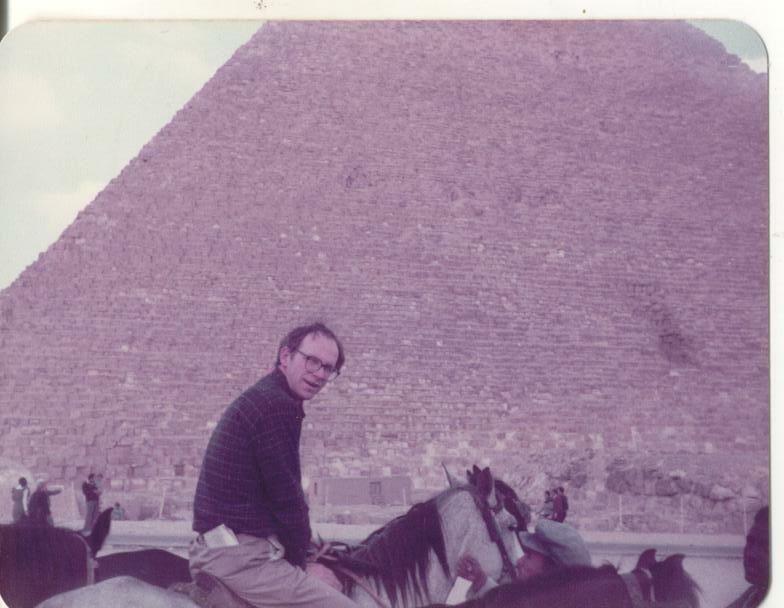 With the Middle East in mayhem, I’ve been thinking back to my travels in Egypt and Israel during a less tumultuous time. Upon returning to my teaching post in snowy Salzburg Austria, I found myself suffering from a fever – possibly a result of the sudden change from shirtsleeve weather to freezing cold. From the confines of my sick room, I had a week to recuperate before classes resumed. What better way to pass the solitary hours than by writing an account of the previous two weeks, my Christmas in the Holy Land. Here (with a little editing) is what I wrote three decades ago. Sunday afternoon, Dec. 16, 1984. Enjoyed a scenic charter flight from Munich, West Germany to Tel Aviv, Israel. En route over the Aegean Sea, the pilot kindly invited me into the cockpit where he could more easily answer the geography questions with which I’d been annoying the flight attendants. It was a beautiful bright day, and the panorama of the cockpit was far preferable to the porthole windows. And so I got my first good look at Greece and its white washed villages perched on the islands below. The pilot had recently toured Patmos with his family, and pointed out to me the isle of St. John’s exile (Revelation 1:9) where the Apostle composed the last book of the Bible. Landed at Ben Gurion Airport near Tel Aviv, the weather was sunny and warm. During the next two weeks there was no cold or rain to speak of, and I could easily have left my bulky coat and umbrella behind. Went out for dinner and smoked a genuine Havana cigar as I strolled along the seashore of the historic Mediterranean. I’d not tasted the superb flavor since going to Canada where no embargo exists on products from Castro’s Cuba. In those days, with Ronald Reagan as President, I was a lot more patriotic than I am in the depreciated Republic of 2014. Still, I felt nothing like remorse for puffing on a good cigar, (anymore than Bobby Fisher would feel in 1992 for playing chess in embargoed Serbia). I should mention that my time in Israel and Egypt was enriched by chancing several times to find female companions. Upon moving to Europe a few months earlier, I’d been thinking seriously about getting married. I was a longstanding bachelor, age 41, living a Catholic lifestyle but tiring of the single life. As it turned out, neither a wife nor more than a hint of romance would come my way in the Holy Land. In the AM, I went to the Egyptian embassy in Tel Aviv to get my visa. As an historian I very much wanted to see the Great Pyramids once in my life. Next to me in the embassy line was a girl from Holland named Iniga. Americans have lots of travel advantages. For example she had to pay triple what Egypt charged me for the one-month visa. Afterwards we had coffee together and walked down to the beach. By next morning she had to be back to the kibbutz where she lives and works. She was about to take a bus; instead she accepted my offer of a ride in my rent-a-car. Her kibbutz, Mayan Barukh, sits on the Lebanese border near Dan, and I developed a general plan of driving south from there until reaching Jerusalem. In the mean time, Iniga and I drove northward toward Nazareth and Afula beyond. On a sudden impulse I turned into a relatively impoverished west bank Palestinian village to photograph the beautiful minaret of a mosque. The detour might have cost us a lot more than we counted on, maybe even our lives. Immediately people began gathering around the car and staring at us. It was not a little unnerving, especially after the crowd grew to 30 or 40 people, none of them smiling. A bearded man approached who looked to have some status, perhaps a village elder. My efforts to communicate in English were useless, as I tried to explain that we were just tourists looking for a picture. I remember the blood rushing to my face as I tried vainly to keep my calm, wondering meanwhile if there was some Islamic ban on cameras where a holy place was concerned. By now a throng completely surrounded the vehicle. Feeling extremely vulnerable (I should say scared) and seeing no viable alternative, I got back into the driver’s seat as nonchalantly as I could manage, started the engine, and put the car into reverse. You can imagine my relief, and Iniga’s, when the crowd parted and we drove right out of the village and back onto the highway. (Fortunately this case of impulsive imprudence took place in 1984 – rather than three years later during the first Intifada). The kibbutz is heavily fortified by barbed wire, several watchtowers, two tanks, and but a single entrance. Guards were armed with the omnipresent machine gun. A fortnight earlier two Katusha rockets had landed in the nearby fields and the kibbutz went on alert with non-military personnel confined to quarters. Iniga introduced me to a number of the resident volunteers – Dutch, British, South Africans. We stayed up late that night, and one of the South Africans gave me a close call on the chessboard. After a good breakfast at the kibbutz I headed east to Dan, still only a short distance from the northern border of Israel. Visited a museum, a nature preserve in a beautiful setting at a source of the Jordan River, and Tel Dan, the partially excavated ruins of the Biblical city. About 1100, B.C. Dan, one of the twelve tribes of Israel, conquered the city and held it for several centuries until the Assyrians subdued the northern kingdom of Israel. I was quite alone in this beautiful and historic setting and very glad to be traveling during the season when gawking tourists are few, except for the holy cities that related to Christmas week – Jerusalem, Nazareth, and of course, Bethlehem. Next I started up into the Golan Heights. The car was a Ford Fiesta; it ran very well and was good on gas – happily since it cost about 25 dollars to fill the tank, which was no small sum for a prep school teacher paid in Austrian shillings (not replaced by the Euro until 1998). 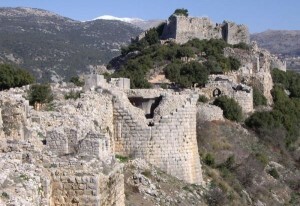 High in the hills overlooking the upper Jordan Valley was the “Nimrod Fortress,” a crusader structure built early in the twelfth century to guard the Christian kingdom of Jerusalem and its northeast frontier against the Saracens. 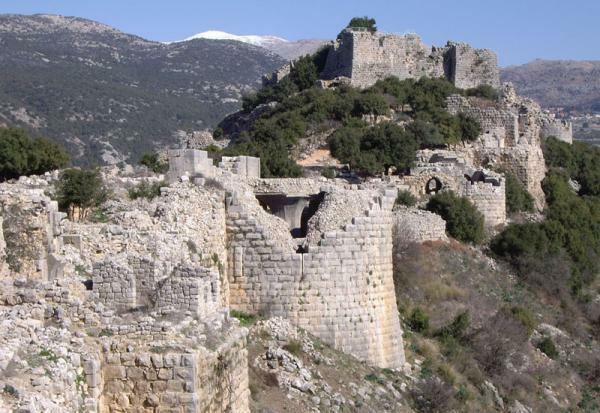 In c. 1170 it fell to Saladin who led the Islamic counter-crusade. The ruins are still in pretty good shape after 800 years. Walking about the extensive fortress grounds, I met a Canadian couple and their young son. As an example of the compactness of Israel I would later run into them in a Tiberias grocery store, and yet again in a Jerusalem restaurant. Driving up on the Golan itself, I became quite lost with nearly all the road signs in Arabic. [Elsewhere in Israel a sign had both Hebrew and English]. I worked my way generally south, using snow-capped Mt. Herman in the distance, which I knew to be north, as the next best thing to a compass. Asked directions at a moshav, a less stringently communistic form of communal village than the Kibbutz. Fortunately, I came across an Israeli soldier hitchhiking who knew the roads and directed me down to the vicinity of Lake Galilee. (I have a photo of him in full battle dress at the bridge over the Jordan River). After letting him out at his stop, I proceeded to a hill overlooking the northern shore of the Sea of Galilee near where the Jordan flows into it. Below was Capharnum, and nearby was the Mount of the Beatitudes – both famous places in our Savior’s work. It was a beautiful site and a little dirt road offered the occasion for a walk, another cigar, and the opportunity for contemplation. Before dusk I had time for half an hour at the ruins of Capharnaum on the lakeshore where stands the foundation of an ancient synagogue; also the remains of St. Peter’s house, which served not only as the Apostle’s home but probably also as the headquarters and residence of Christ during His active ministry. On to modern Tiberias near where Herod Antipater lived, and where I spent the night in the Washington Hotel, a 4 star for only $19 per night. Went to morning Mass at St. Peter’s, a small crusader era church with its sanctuary shaped like the prow of a ship pointing toward the nearby lake. Drove down to the south of the lake, then west to Mt. Tabor where the Transfiguration is thought to have occurred. Beautiful modern monastery on top; also the ruins of the Benedictine monastery whose monks were massacred when the main crusader state fell in the 13th century. Sitting among the ruins there, one has a great deal to think about. Not least of which is a fabulous view that includes Nazareth out in the distance. Perhaps the boy Jesus had taken some hikes up here. The proximity between Mt. Tabor and Nazareth is a fact about which I’d never noticed anything in books. Indeed, travel provides a lot that libraries cannot. Next I spent some time in Nazareth itself, mainly at the Church of the Annunciation built by the Franciscans over a traditional site of the Holy Family’s residence. It was dusk and Nazareth is not an attractive town nor, I suspect, very safe at night. So I started back to Tiberias, stopping to buy oranges in Cana where the miracle of the wedding feast (water to wine) took place. Here, at the behest of the Blessed Virgin Mary, Christ performed his first public miracle. Spent another night in the Washington Hotel, and at dinner I met several members of a Bible study group from the USA, representing various denominations. 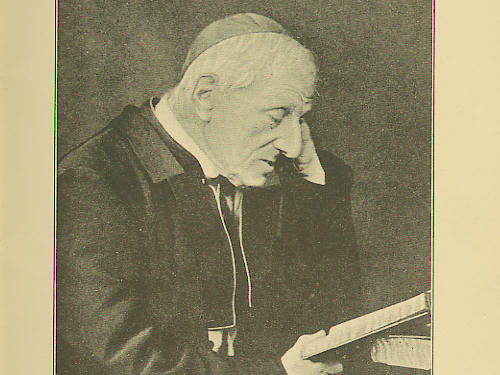 One was a Catholic seminarian of liberal propensities, with a brazen female friend who had no compunctions about denying the doctrine of the Holy Trinity. I became angry enough to break off the conversation unceremoniously because, as I told them, I didn’t come to the Holy Land to hear our Lord’s divinity contradicted. More positively I met Claire Childress, an attractive and charming resident of Denver, Colorado. She and I drove downtown and found an outdoor table at a beachfront restaurant, with the Sea of Galilee lapping almost at our feet. She was studying for some sort of hospice ministry. Found myself wishing I could see her again and, in amazing circumstances, Bethlehem was the place. Drove down the Galilee shore again to the place where the Jordan River exits the lake and starts its journey, 70 miles due south, to the Dead Sea. I too took that journey. Although military frontier fences prevent one from approaching the Jordan River bank, it was sometimes visible from the road, as well as farms and villages on the east bank in biblical Gilead, now the nation of Jordan. The grinding poverty of the Palestinians, the predominant population of this region, is heart-rending to behold. Their lot can hardly be much improved over the economy of antiquity, and it is doubtless harder to bear given the close contrast with 20th century affluence which the Jewish population enjoys. I saw very little of Jericho, which is a sizeable Palestinian city. The most interesting site I did see there was the adobe suburb recently evacuated forcibly as the government considered it a breeding ground for terrorists. Indeed it was the strangest looking ghost town I ever beheld. Continuing south I reached the Dead Sea, the lowest spot on earth, some 1300 feet below sea level. I hiked down to the beach and dipped my hand into the fairly warm and extremely salty water. I’m told swimming is a strange experience, the water being so buoyant that sinking is impossible. If you wade out very deep your feet start swinging up. I thought about continuing south along the Dead Sea road, but it ran through utterly deserted country and I was running low on gas. So I decided to turn back and head northwest to Jerusalem. It was a long climb and I could relate to the old phrase, “come let us go up to Jerusalem.” On the outskirts of the city I picked up a hitchhiker – a Hassidic Jewish resident of Jerusalem. He guided me through a labyrinth of streets to a parking place right by the downtown tourist information center. They directed me to the Palatin Hotel, 4 Agripas St., a 3 star for $18/night – a first rate breakfast included – where I would spend the next six days. It is located at a central crossroads about ten minutes walk from the Old City walls. One of the aspects of Jerusalem that strikes the newcomer is the number of soldiers strolling the streets armed with Uzi submachine guns. A soldier always has his weapon, even when out on a date with his girlfriend. She often carries a smaller version. As a case in point, I went to McDonald’s, or rather McDavid’s as its almost mirror image is named in Jerusalem. The dining room was occupied except for one empty booth. I put my coat and hat there to hold it, and got in line at the counter. An Israeli couple came in, spotted my booth and dropped their coats and amazingly, their two Uzis, on the floor by the booth. After they got in line behind me I got my tray and had to step over both guns to take my seat. By the time they got their tray, another booth opened up and they sat elsewhere. I’ve often wondered how a terrorist would have exploited their carelessness. Drove south in the AM to Bethlehem. Omnipresent tour guides are like hucksters in Mexican border towns: you can hardly shake them ! I managed to find some solitude, nevertheless, and wandered into the Armenian monastery next to the church of the Nativity. A man in maybe his early 20’s struck up an acquaintance, and he guided me free of charge through the monastery which had long been his home. He took me through a locked door which he knew how to open and up onto the roof. By the bell tower we had a panoramic view of the city of the City of David. (Hope that very kind young man had a happy life). Alone again, I went into the Church of the Nativity; it is Greek Orthodox and dates from the time of St. Helena (d. 330), the mother of the Roman Emperor Constantine. It was she, and the archaeological team she brought with her, who rediscovered many of the holy sites here. 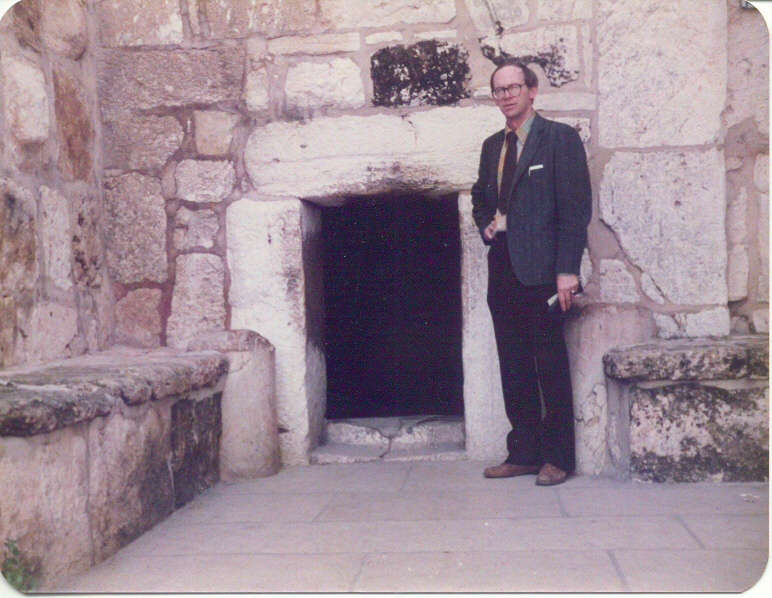 Note the ancient entrance door I’m standing by, designed so low that – be he emperor or peasant – a visitor must stoop into a posture of humility to enter the place of Christ’s birth. I lighted a candle for Dad at the location of the manger where the Virgin Mary gave birth to her divine Son. Elsewhere in Bethlehem I saw the study of St. Jerome where he translated the Bible into Latin (the Vulgate). 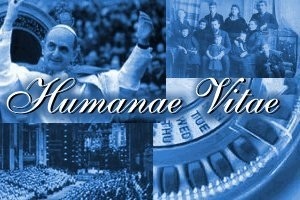 Also I was fortunate to obtain a ticket to the upcoming Christmas Eve Mass. The priest wanted to know if I was a practicing Roman Catholic before he would supply the ticket. Generally I spent the evenings in Jerusalem wandering around, reading, and playing chess. On Fridays at sunset the city goes completely dead for the Jewish Sabbath, but it springs to life again on Saturday at sundown. Drove to the Knesset, the Israeli parliament building, and to the large scale model of ancient Jerusalem as it stood prior to the city’s destruction by the Romans in 70 AD. Spent a couple of hours scrutinizing the closest view one can find to the city as it looked in Jesus’ day. On to the Israel Museum which has an impressive display of archaeological finds and old coins of the region. Later in the afternoon, it being the Jewish Sabbath day, I went to the Wailing Wall and in the evening to a concert and lecture on the works of Franz Schubert. Alas, the talk was entirely in Hebrew, but the music compensated for it. At 6:30 PM, I attended the Sunday vigil Mass at the Notre Dame Center, near the new gate to the old city. It is a beautiful pontifical institute, but its restaurant is expensive. Drove back to Tel Aviv to return the car; it was becoming more trouble in terms of parking than it was worth. The Old City was to be the focus of my remaining time in Jerusalem, and it is best seen on foot. Along the road to Tel Aviv, a 42 miles drive from Jerusalem, there is a stretch of forest which was planted by the Israelis a generation ago. Dropped off the car and caught the bus back to Jerusalem. Sat next to a 17 year old college student (art major) who had been born and raised in a kibbutz. The land had a powerful hold on her, as it does on many people here, and she indicated that even if, God forbid, Israel should loose a war she would nonetheless stay in this country. She had never left Israel but looked forward to visiting Europe someday. It is very expensive for Israelis to travel abroad, partly because of the abysmal exchange rate for the shekel, and also given the 45,000 shekel exit tax they must pay when leaving the country. Her kibutz was financing her studies in Jerusalem, and she was obliged to return after college, giving a year of service to the kibbutz for each year they financed her schooling. Both of her sisters had left the kibbutz for the freedom of city life, much to the dismay of the parents, and she herself was uncertain whether or not to stay after her term of obligatory service was finished. Most kibbutz have separate children’s dormitories where the kids live separately from their parents. She supposed the single family dwelling might be too stifling. In my view, however, kibbutz life would be difficult at best and probably unbearable on a permanent basis – at least from what I’ve seen and heard. The communal feeling of solidarity and extended family would be positive. But even these characteristics are fading, she said, and not what they were 20 years ago. I found the Upper Room, or Cenacle, with the help of a Jewish tour guide, a member of the Jews for Jesus movement. He said there were about a thousand of them in Jerusalem who worshiped in the Synagogue on Saturdays, and secretly (for fear of expulsion from the Synagogue) with their fellow Jewish Christians on Sunday. Evangelists are unwelcome in Israel, and I saw a flyer tacked up warning against any proselytizing by Christians. Seven years earlier (December 1977) the Knesset passed an anti-proselytizing law aimed mainly at Christian evangelists. (As of 2014, nothing like a Billy Graham Crusade has been allowed in Israel. Pathetically, however, the government does provide police protection for Jerusalem’s annual gay pride parade). It was getting dark and on the way back to the hotel I found the local chess club and played about five games against their top player. I gave him a run for his money but he was too strong. In the last game he insisted on making it for money. I would have been wise to refuse, not just for monetary reasons but to avoid the bitter taste it left in my mouth. While we were playing, the two middle aged men at the chess table next to us got into a heated dispute over taking a move back. Never before or since have I seen two chess players completely loose their self-command, pounding on the table and physically pulling on each other’s coats. Their faces were red with rage, and the whole spectacle was conducted in Hebrew. My opponent had to summon the club owner to restore order. Monday, Dec. 24. Christmas Eve. Walking through the Old City I met Cecilia Blewer, a young lady from Philadelphia PA. She was studying theology at Hebrew University in Jerusalem. After she purchased some pottery we went out for coffee. She was quite intelligent and well spoken. Her impressions of the locals were not altogether positive, and some of the stories she told tended to shake my preconception of Israelis as a highly industrious people. On the contrary, she considers them “shiftless” with a Mediterranean attitude toward labor, and their workmanship shoddy. Their products are of such a quality that the export trade is minimal in finished products and manufactured goods; which helps, she thinks, to explain the country’s economic problems. I’m still reluctant fully to accept her views or to apply such sweeping generalizations to the citizens of this unique nation. 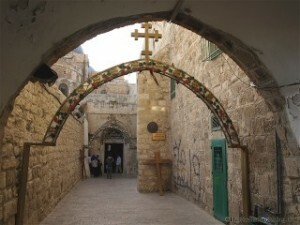 Next I went to the Via Dolorosa along which the Savior carried the cross. Joined an English speaking group of a dozen or more led by a Catholic priest. 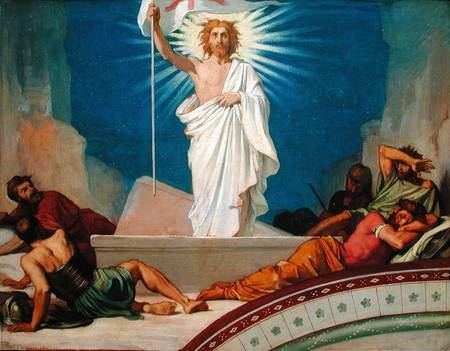 Along the way a man whom I’d met earlier harangued us for carrying the cross because, he shouted, the Resurrection nullified all that. We made the fourteen stations in Christ’s footsteps, ending in the Church of the Holy Sepulcher over Joseph of Arimathea’s tomb where the burial and Resurrection took place. The huge church was constructed during the reign of Constantine and also encompasses the rocky hill known as Mt. 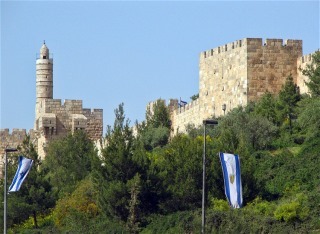 Calvary – site of the crucifixion. A group of 20 or 25 Israeli soldiers was touring the church, and outside in the courtyard they had stacked their Uzis in a pile guarded by two of their comrades. I have a photo of myself and one of the soldiers standing by the stack of weapons. Played some more chess that evening (with better results than the previous day) and caught the bus at 7:30 PM for midnight Mass in Bethlehem. Two Dutch girls also staying in my hotel accompanied me and we quickly struck up a friendship. Margot was touring with Margaret, her old friend, who worked in a Kibbutz as a temporary volunteer. The girls did not have tickets to the Mass and had to stand in Bethlehem Square and watch the live broadcast by closed-circuit television. We got our passports stamped with a special Christmas Eve insignia by the post office, listened to choirs performing for the occasion (including one from the USA) and at 11:30 PM I left the girls and entered St. Catherine’s, the Roman Catholic church right next to the Church of the Nativity. The latter is Orthodox and their Christmas celebration would not take place that year until January 7th. As expected St. Catherine’s Church was packed shoulder to shoulder with almost everyone standing so that more ticketholders could enter. After an hour I turned around in hopes of finding a better vantage place, only to see Claire Childress, whom I had met in Tiberias, waving at me. She had obtained her ticket in an extraordinary fashion that would take a page to explain. The Mass was broadcast worldwide and I wonder if anyone saw us. It was 3AM before the festivities ended and we got back to our respective hotels. The next day (Dec. 25th) Claire and I met up and spent Christmas together touring the old city. Took a promenade atop the wall and toured the upper room, David’s tomb, and the Benedictine Church of the Dormition, where tradition has it that the Virgin Mary fell into a death like sleep prior to her Assumption. Her empty tomb is in a Greek Orthodox site about a mile away. At the Church of the Dormition Claire was quite interested in mosaics depicting six women of the Old Testament: Eve, Miriam, Jael, Judith, Ruth, and Esther. While we were going along a sidewalk, a rabbi speaking with a distinct Brooklyn accent asked us to step into his synagogue. Strewn all about was damage from a bomb which had gone off some days before. Another time during my trip, a city bus had been bombed. And yet the routines of life were relatively uninterrupted, and the streets did not strike us as unsafe. I had to be up bright and early next morning, so I said goodbye to Claire. She gave me some money to shop in Cairo for a genuine Egyptian cartouche, which I would mail to her. At 6:30AM, the tour bus left for Cairo. We spent four hours in customs at the border crossing just south of the Gaza Strip. We were delayed because several Israelis were aboard the bus and the Egyptians gave them a lot of security scrutiny. Then we began the long drive across the Sinai Desert, with the Mediterranean sometimes in view from the highway. In another crossing of paths, the passengers included Iniga in whose Kibbutz I had stayed. She was traveling with her boyfriend, a medical student in Holland. He and I started playing chess during the customs holdup; the game ended with his resignation aboard the bus somewhere between the Suez Canal and the Nile River. The canal cannot be seen until you’re almost upon its eastern shoreline, but from maybe a mile away you do see massive cargo ships. They give the strange appearance of sailing the desert sands. A ferry, little more than a flat barge, loaded the bus and some cars and took us across to the west bank. Lots of fishermen were plying their nets in the canal which is at sea level from the Red Sea to the Mediterranean. Our bus arrived about 7PM in Cairo, and I checked into a nice room at the Indiana Hotel. It’s about two blocks west of the Nile River. Nice situation for three nights: the room, breakfast, transportation and a tour of Cairo were all provided by Galilee Tours of Israel for a mere $110. The tour at 9AM included Sadat’s tomb, Saladin’s citadel, a Tenth Century synagogue built on the supposed site where Pharaoh’s daughter discovered the baby Moses floating in the Nile in a papyrus basket; also a papyrus factory, as well as the Pyramids and the Sphinx. The traffic in Cairo is incredible to behold. Despite wide streets lacking marked lanes, very few serious accidents occur, I’m told. With a multitude of uniformed traffic officials sporting white gloves, combined with a veritable cacophony of honking horns, the commute works. The drivers are indeed skillful. Grinding poverty is another feature of Cairo, although the back streets near my hotel seemed a safer to walk at night than downtown Seattle. The “winter” weather was clear and balmy, but not excessively hot as during the rest of the year. December is definitely desirable for a visit to Egypt. Cairo was, in short, a pleasant surprise to me. I had no problems with the food, but I did drink bottled water. People in the tour who were staying at the Indiana Hotel included Dutch, Australians, Palestinians, and two girls traveling together. Both girls lived in Paris and were somewhere in their 20s. Patricia Madoune was a political exile from Chile, with refugee status in France; and her friend, Anna, was from Brazil. Both were quite European in looks and appeared to have upper class backgrounds. Soon we became friends and formed a triumvirate. Patricia’s story was especially intriguing. Her grandfather was a member of the Parliament in Chile under President Salvador Allende, an avowed Marxist. A military coup (1973) resulted in the President’s death when soldiers stormed La Moneda Palace after Allende’s famous vow, “you’ll have to carry me out in wooden pajamas.” A 17 year dictatorship ensued under General Augusto Pinochet. The Pinochet regime sent much of Patricia’s family to jail, and some of her friends were killed. She herself went into exile in France where she became a student at the Sorbonne. My feelings regarding the Pinochet regime are perhaps more negative for having met Patricia, although I cannot share her leftist political views. Nor do I have any empathy for Communist governments like Allende’s. Patricia, Anna and I started the morning with a tour of the Egyptian Museum. The collection of antiquities from ancient Egypt is mind-boggling for both its quantity and antiquity. The colors on a painted sarcophagus dating from 2000, B.C. are still as bright as a Technicolor movie. In Seattle I never did take in the Treasures of Tutankhamen exhibit (which toured the world) but here in Cairo I was able to see it entire. Someone told me you haven’t seen Egypt until you’ve seen the Egyptian museum, and to that I will say amen. In the afternoon I took a taxi to the Great Pyramids of Giza. The cab driver had a Koran in a box on his dashboard, and informed me that the book is read continuously on a radio station dedicated for the purpose. He let me listen for a while on the car radio and, although it was all in Arabic, I found the cadences pleasant to hear. All about the vicinity of the Pyramids horses are for rent, and I managed to get a four year old Arabian mare. It took some bargaining, but I rented the horse for two hours at five dollars flat. I went alone and without a guide – a great choice. At first my mount acted like a stable horse, and wouldn’t obey or run; but I talked to her a lot, hugged her neck several times, and dismounted to walk her past places where she balked. After we got away from the crowds, maybe half a mile from the pyramids, she came to life and I could bring her to a full gallop merely by clicking my tongue. She ran like the wind, and flying across the desert with the 4700 year old pyramids in full view was one of the most exhilarating experiences of my life. We (the horse and I) had a splendid time together, and it was with regret that I parted from a friend never to be forgotten. I then accepted a guide’s offer (he said he wanted no money, but just the practice of speaking English) who gave me a walking tour of the many burial chambers nearby, some older than the pyramids, replete with vivid hieroglyphic inscriptions. It was dusk and the guide would light old newspapers which were strewn around and use them as torches which he tossed down into the vault. The fire’s eerie glare and shadows playing on the hieroglyphics covered walls gave these ancient burial chambers an appearance which Edgar Allan Poe would have relished. How could I know whether he had a dagger concealed under those Arabian robes? I explained that I was a schoolteacher and did not have a lot of money. I took a fighting stance and stared back at him. This standoff lasted maybe 30 seconds without a word being spoken. I was much taller than him and maybe I looked determined. For whatever reason, he turned around and disappeared into the night. Far in the distance I could see some lights, so I hiked across the sand, skirted quietly around some Egyptians sitting on camels, and made it to a wall surrounding the veranda of a restaurant. I got over the wall, cut through to the street, and hailed a taxi. Once back to the Indiana Hotel, I thanked the good Lord that I did not leave my body in the desert stripped of wallet, identification, passport, etc. ; and with no way for my mother back in Seattle to know whatever happened to her one and only son. The bus ride across the Sinai Desert was memorable. Patricia and Anna made great travel companions and I smoked a pretty fair Dutch cigar which I bought in Cairo. Many foreign armies from the Hyksos of c. 1680, B.C. to the Macedonians under Alexander the Great, to Napoleon in modern times have crossed the Sinai in quest of empire. In 1967 the Israelis crossed it as far as the Suez Canal, and I felt myself fortunate to have the opportunity of a peaceful excursion through this arid yet scenic terrain. The poverty of the people who scratch out a living here makes one grateful for his privileged economic status. Patricia, Anna and I went for a stroll along the beach in Tel Aviv and took in a marvelous view as the sun set over the Mediterranean Sea. It was our little triumvirate’s last Middle Eastern sunset. Their flight to Paris left early the next morning, and mine next afternoon. I stayed again at the Maxim Hotel, and after packing for my flight to Munich, I went to 11AM Mass at St. Anthony’s in the old city of Jaffa, two miles south of Tel Aviv. The choice of churches in this Jewish city is extremely limited and I encountered a couple from South Carolina who tried in vain to find Baptist services. I ended my explorations at the site of Simon the Tanner’s house where St. Peter stayed (Acts 9:43). Here he had his visions about the mission to the Gentiles, and it seemed a fitting place from which to take leave of the Jewish state. Already I was imagining a return trip. For one thing the food was better than what I got in Austria. Also, English was much more widely spoken and American tourists more highly regarded than in Austria. And it is easier for the tourist to see in two weeks, given that its area is less than half of Austria’s. Don’t get me wrong: I loved living in Austria, 1984-86. Österreich was a fine country – as nations go – but Israel was awe-inspiring. One of the most memorable times in my life.